The Nominate This bookmarklet allows you to visit a static page on the web and nominate the page content or draft it as a WordPress post. The Nominate This bookmarklet, once placed in your browser&apos;s bookmarks bar, can be used to nominate any item, even those not associated with RSS/Atom feeds. 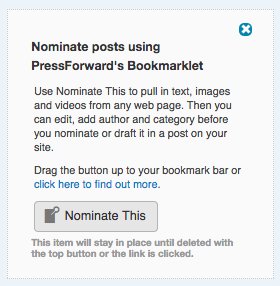 Version 4.3 and Later: If you are experiencing issues with the Nominate This bookmarklet, please make sure that you are using the latest version of PressForward. After updating the PressForward plugin please make sure to uninstall the bookmarklet (delete the bookmarklet from your bookmarks bar) and then reinstall the updated bookmarklet from the Tools tab in PressForward. The Nominate This bookmarklet can be found in two places. You can select Tools from the PressForward menu in the WordPress sidebar. You can also find the bookmarklet as the first item in the All Content panel. 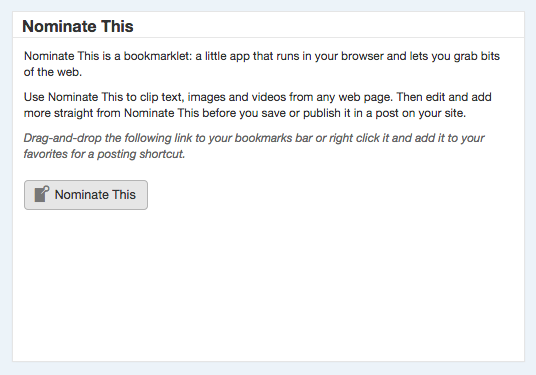 To complete the installation, drag and drop the Nominate This bookmarklet into your browser’s bookmarks bar. In your browser, open a blog post, article, or web page that you would like to nominate. Check to be sure that the information you would like to display in the nomination is displayed in the Nominate This popup window. Add the author name(s) in the box provided above Enter Authors if you wish to include that metadata. Add or select any Categories or Tags. If you choose not to at this stage, admins will have a chance to do so when the item is sent to draft.